Over the past week, the small catamaran ROYAL CHARTER has been surveying the river bed on behalf of Clydeport. This view of her passing the mouth of the River Cart was taken earlier in the week, when she was surveying at Rothesay Dock on Tuesday. 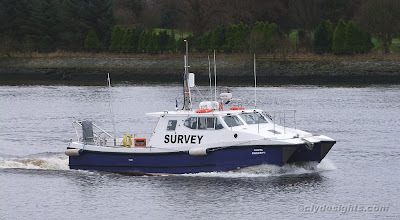 She has also been surveying off Greenock Ocean Terminal, and in the mouth of the River Leven. Built at Cork in southern Ireland by Safehaven Marine in 2007, ROYAL CHARTER is owned by the Port of Liverpool and is 12 metres long. She is capable of speeds of up to 27 knots.